This Crosley Retro icon from the 1950's is in absolute mint condition, the best example I have seen in all my years of collecting over the entire country. It's just in beautiful original condition. Anyone who is familiar with these radios knows that the metal clock and radio escutcheons almost always show wear from 60 years of use. The escutcheons on this set are in really beautiful shape. 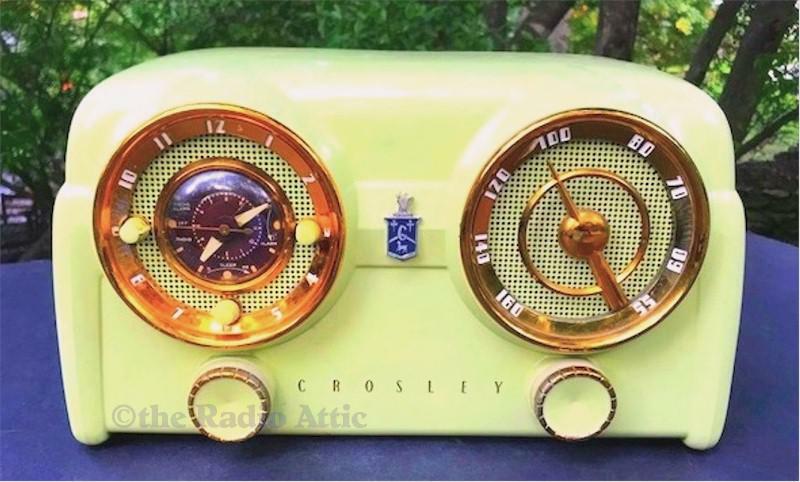 The lime green color coordinated clock knobs are on the radio, and the original back also. There is also an complete label on the bottom. The clock is working, keeping good time. And the radio is working and playing and picking up all my local AM stations clearly. If you are looking for a nearly perfect D25 in a super color, look no further. About 13"W x 7-1/2"H x 7"D.
You are visitor number 811 to this page.